Covering the conflict between Sparta and Athens and their respective allies in the 5th century BCE this is a fascinating insight into ancient Greek politics, war and society in a crucial period of Greece's history. Not only are the major political incidents and battles covered but there are a plethora of side stories, speeches, and details on other contemporary powers, notably, Persia. This Landmark edition, like the sister editions of Herodotus and Xenophon, is superb and by far the best and most user-friendly edition of any ancient text ever produced. The translation is a modernised version of the classic Crawley text and reads well. Maps galore, mini-paragraph summaries in every margin, footnotes, extensive index, page headlines indicating the year and subject of each page and an extensive chronology of key events mean the reader can immediately orientate themselves as to which point of the war is under consideration. There are also a good few black and white illustrations and many useful appendices which describe in a nutshell such key topics as Athenian, Spartan and Persian government, warfare and society. An absolute gem of an edition. Cartwright, Mark. "The Landmark Thucydides." Ancient History Encyclopedia. Last modified May 28, 2013. https://www.ancient.eu/review/33/. Cartwright, Mark. 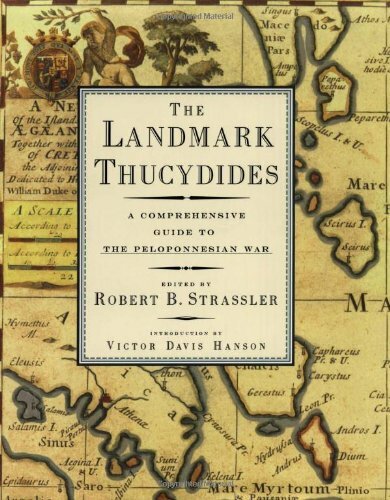 "The Landmark Thucydides." Ancient History Encyclopedia. Ancient History Encyclopedia, 28 May 2013. Web. 23 Apr 2019.